It finally rained! 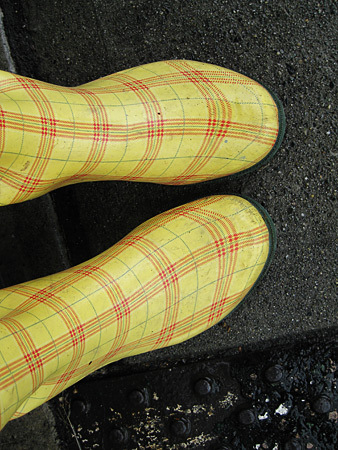 It’s been a crazy hot summer in Vancouver & momma was missing her rainy afternoons & shiny yellow boots. We broke some kind of record for the most days without rain in over 40 years which means all the lush green that I so love about living on the wet coast was brown and dying. Fortunately it doesn’t take much to get the green going again! It’s another hot day today, but since I somehow managed to come down with an icky summer flu, I’ll be sticking to lemonade on the patio instead of doing anything too strenous this weekend. My body somehow knew how to time this nasty bug perfectly, so I should be grateful for that. This is the only weekend in all of July & most of August that I’m not working a craft show. I keep madly flipping through my day planner, sure that I’m forgetting something. I have plenty of the usual workload & deadlines that are fast approaching, but no in person events scheduled. Which means I get to spend my mister’s entire day off with him! Huzzah! Have a happy weekend sweet peas!